For other uses, see Ternate (disambiguation). Ternate is the largest city in the Indonesian province of North Maluku and an island in the Maluku Islands. It was the capital of the former Sultanate of Ternate and de facto provincial capital of North Maluku before being moved to Sofifi in 2010. It is off the west coast of the larger island of Halmahera. The city has a population of just under 200,000 on some 111.39 km2. Like its neighbouring island, Tidore, Ternate is a visually dramatic cone-shape. The two are ancient Islamic sultanates (Ternate's Sultanate and Tidore's) with a long history of bitter rivalry. 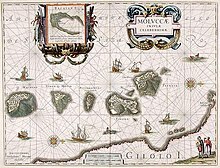 The islands were once the world's single major producer of cloves, a commodity that allowed their sultans to become amongst the wealthiest and most powerful of all sultans in the Indonesian region. In the precolonial era, Ternate was the dominant political and economic power over most of the "Spice Islands" of Maluku. The "Ternate Essay" was a pioneering account of evolution by natural selection written on the island by Alfred Russel Wallace in 1858 and famously sent to Charles Darwin. Darwin at once responded by publishing Wallace's essay alongside his own accounts of the theory. Ternate and neighbouring Tidore were the world's major producer of cloves upon which their rulers became among the wealthiest and most powerful sultans in the Indonesian region. Much of their wealth, however, was wasted fighting each other. Up until the Dutch completed the colonization of Maluku in the 19th century, the sultans of Ternate ruled empires that claimed at least nominal influence as far as Ambon, Sulawesi and Papua. The peak of its power came near the end of the sixteenth century, under Sultan Baabullah, when it had influence over most of the eastern part of Sulawesi, the Ambon and Seram area, and parts of Papua. It engaged in fierce competition for control of its periphery with the nearby sultanate of Tidore. According to historian Leonard Andaya, Ternate's "dualistic" rivalry with Tidore is a dominant theme in the early history of the Maluku Islands. In part as a result of its trade-dependent culture, Ternate was one of the earliest places in the region to which Islam spread, probably coming from Java in the late 15th century. Initially, the faith was restricted to Ternate's small ruling family, and spread only slowly to the rest of the population. The first Europeans to stay on Ternate were part of the Portuguese expedition of Francisco Serrão out of Malacca, which was shipwrecked near Seram and rescued by local residents. Sultan Abu Lais of Ternate heard of their stranding, and, seeing a chance to ally himself with a powerful foreign nation, he brought them to Ternate in 1512. The Portuguese were permitted to build a fort (Kastella) on the island, construction of which began in 1522. Relations between the Ternateans and Portuguese were strained from the start. An outpost far from Europe generally only attracted the most desperate and avaricious, such that the generally poor behaviour of the Portuguese combined with feeble attempts at Christianisation, strained relations with Ternate's Muslim ruler, as did their efforts to monopolise the spice trade and dominate local politics. In 1535 King Tabariji was deposed and sent to Goa by the Portuguese. He converted to Christianity and changed his name to Dom Manuel. After being declared innocent of the charges against him he was sent back to reassume his throne; he died en route in Malacca in 1545. He had, though, bequeathed the island of Ambon to his Portuguese godfather Jordão de Freitas. 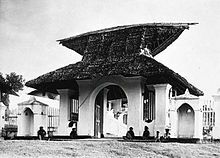 When Sultan Hairun was executed and his head exhibited on a pike in 1570, Muslim Ternateans rebelled against the Portuguese who were besieged in their castle until 1575 when a new Sultan made the castle his palace. Ambon became the new centre for Portuguese activities in Maluku. European power in the region was weak and Ternate became an expanding, fiercely Islamic and anti-Portuguese state under the rule of Sultan Baab Ullah (r. 1570–1583) and his son Sultan Said. In 1580, the sultan entertained the English adventurer and circumnavigator Sir Francis Drake, who much to the surprise of the Ternateans had no interest in buying cloves as his ship, the Golden Hind, was too full of stolen Spanish-American gold to carry cloves. As the Portuguese battles in the Indian Ocean against Muslim Powers raged on, Ternate became a site of interest especially for the Ottomans, who had gained much information about Maritime Southeast Asia from the Sultanate of Aceh, and in fact Kurtoğlu Hızır Reis, the Ottoman Admiral, intended to reach both Java, Borneo and Ternate but was engaged in pitched battle and was outnumbered against the Portuguese Fleet in Sumatra. Spanish and Dutch traders competing for control over the lucrative clove trade played Ternate off against Tidore. The Dutch eventually became the dominant European power although the sultanates were in place almost continually until today. Spanish forces captured the former Portuguese fort from the Ternatese in 1606, deported the Ternate Sultan and his entourage to Manila. In 1607 the Dutch came back in Ternate where with the help of Ternateans built a fort in Malayo. The Spaniards occupied the southern part of the island where they had their main settlement the town of Ciudad del Rosario. The island was divided between the two powers: the Spaniards were allied with Tidore and the Dutch with their Ternaten allies. For the Ternatean rulers, the Dutch were a useful, if not particularly welcome, presence that gave them military advantages against Tidore and the Spanish. Particularly under Sultan Hamzah (r. 1627–1648), Ternate expanded its territory and strengthened its control over the periphery. Dutch influence over the kingdom was limited, though Hamzah and his son and successor, Sultan Mandar Syah (r. 1648–1675) did concede some regions to the Dutch East India Company (VOC) in exchange for help controlling rebellions there. The Spaniards abandoned Ternate and Tidore in 1663. When they abandoned Ternate, some of the people accompanied the Spanish in their retreat to the Philippines. In the Philippines, they settled in Ternate, Cavite which they named after their homeland. In the 18th century Ternate was the site of a VOC governorship, which attempted to control all trade in the northern Moluccas. By the 19th century, the spice trade had declined substantially. Hence the region was less central to the Netherlands colonial state, but the Dutch maintained a presence in the region in order to prevent another colonial power from occupying it. 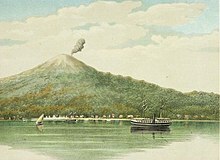 After the VOC was nationalised by the Dutch government in 1800, Ternate became part of the Government of the Moluccas (Gouvernement der Molukken). Ternate was occupied by British forces in 1810 before being returned to Dutch control in 1817. In 1824 became the capital of a residency (administrative region) covering Halmahera, the entire west coast of New Guinea, and the central east coast of Sulawesi. By 1867 all of Dutch-occupied New Guinea had been added to the residency, but then its region was gradually transferred to Ambon (Amboina) before being dissolved into that residency in 1922. In 1858 Alfred Russel Wallace wrote his paper on evolution here, which he sent to Charles Darwin for his attention. Contrary to popular belief, Wallace had not published a paper on evolution before 1858, nor had he intended the "Ternate Essay" to be published in the form in which he sent it to Darwin. This progression, by minute steps, in various directions, but always checked and balanced by the necessary conditions, subject to which alone existence can be preserved, may, it is believed, be followed out so as to agree with all the phenomena presented by organized beings, their extinction and succession in past ages, and all the extraordinary modifications of form, instinct, and habits which they exhibit. Darwin at once decided to publish his own work, and arranged for Wallace's "Ternate Essay" and extracts of two of his own accounts of evolution, to be read at the Linnean Society of London on 1 July 1858. Like the rest of Indonesia, Ternate was occupied by Japanese forces during World War II; eastern Indonesia was governed by the Navy. After Japan surrendered in August 1945 and Indonesia declared independence, Ternate was reoccupied in early November 1945 by Allied forces intending to return Indonesia to Dutch control. It became part of Maluku province when Indonesia became independent. Ternate saw some violence in the 1998–2000 sectarian conflict across the Maluku islands, not, however, to the extent of other islands such as nearby Halmahera. As of 2003, former churches and cinemas on Ternate were occupied by refugees from the Halmahera violence. Ternate lies in a very active seismic region where active volcanic activity and frequent earthquakes are common. Ternate belongs to a group of islands that make up the Ring of Fire, known as the Circum-Pacific Belt. Around 90% of the world’s earthquakes and seismic activity occur in this 25,000-mile (40,000-kilometre) arc in the base of the Pacific Ocean. The region consists almost entirely of an uninterrupted chain of volcanic arcs and oceanic trenches, and experiences continual plate movement. There are 452 volcanoes in the Pacific Ring of Fire, accounting for 75% of the world’s dormant and active volcanoes. Ternate is dominated by the volcanic Mount Gamalama (1715 m). An 1840 eruption destroyed most houses. Recent eruptions occurred in 1980, 1983, 1994 and 2011. During the 2011 eruption, Indonesia closed a domestic airport near the volcano for several days following ash emissions that reached 2,000 metres (6,600 feet) into the atmosphere. The foothills are home to groves of clove trees, and climbs to the peak of the volcano can be made. The airport lies along the northeast coastline. Hiri island is a volcanic cone lying off the northern tip of Ternate. Crocodile-infested crater Tolire Lake lies in the northwest and is bordered by sheer cliffs. Ternate beaches include Sulamadaha (on the northern tip), Afetaduma and Jouburiki in the west, and the beach at the village of Kastela in the southeast. Most inhabitants of Ternate are Muslim. The indigenous inhabitants of Ternate speak the Ternate language, which is a non-Austronesian language, belonging to the North Halmahera branch of the West Papuan languages. Ternatean should be distinguished from Ternate Malay, which is a Malay-based creole, serving as the local lingua franca. Many inhabitants of Ternate use Ternatean as their first language and employ Ternate Malay as a means of interethnic or trade communication, although the usage of traditional Ternate is declining. The nationwide Indonesian language is also relatively well known and understood. Ternate city (which includes various minor islands as well as the main island of Ternate) is divided into 7 districts (kecamatan) as detailed below. with their areas and 2010 Census population. Four of these districts are on the island of Ternate, while the remaining three each consist of a smaller neighbouring island. Note * Pulau Ternate district now consists of the more rural western half of Ternate island. Sultan Babullah Airport is the main gateway to the city, serving several flights to other cities in Indonesia such as Jakarta, Makassar and Surabaya. It is served by Wings Air (Group Lion Air), Merpati Nusantara Airlines, Express Air of Trigana Air. The Ahmad Yani seaport is the main seaport of Ternate, which served different type of ships from different parts of the archipelago. Ships operated by Pelni connect Ternate with other cities such as Ambon and Manado. There are numerous old forts that were built by different empires during the colonial era scattered around the city. Examples of forts built by the Portuguese are Fort Kalamata and Fort Tolukko. Fort Oranje, which was built by the Dutch, is the largest fort on the island. It was the headquarters of the Dutch East India Company until the company moved their headquarters to Batavia (Jakarta) in 1619. Some forts no longer exist, leaving only ruins, such as Fort Kastela, which was built by the Spanish. The palace of the Sultan of Ternate still exists. It is now converted into a museum. The museum displays artifacts from the Sultanate of Ternate at its maximum extent, such as weapons, armor and traditional Ternatean clothes. Ternate, Cavite, a municipality in the Philippines located at the entrance of Manila Bay and about 60km southwest of Manila is named after Moluccan settlers from Ternate. ^ "Indonesia: Administrative Division (Provinces, Regencies and Cities) - Population Statistics, Charts and Map". www.citypopulation.de. Retrieved 2 April 2018. ^ a b c d e f g h Witton, Patrick (2003). Indonesia. Melbourne: Lonely Planet. pp. 821–822. ISBN 1-74059-154-2. ^ Ricklefs, M.C. (1993). A History of Modern Indonesia Since c.1300, 2nd Edition. London: MacMillan. p. 24. ISBN 0-333-57689-6. ^ Ricklefs, M.C. (1993). A History of Modern Indonesia Since c.1300, 2nd Edition. London: MacMillan. p. 25. ISBN 0-333-57689-6. ^ Peter Borschberg (2015). Journal, Memorials and Letters of Cornelis Matelieff de Jonge. Security, Diplomacy and Commerce in 17th-Century Southeast Asia. Singapore: NUS Press. pp. 82, 84, 126, 421. Retrieved 30 Aug 2015. ^ Peter Borschberg (2015). Journal, Memorials and Letters of Cornelis Matelieff de Jonge. Security, Diplomacy and Commerce in 17th-Century Southeast Asia. Singapore: NUS Press. pp. 87, 102, 556. Retrieved 30 Aug 2015. ^ a b c d e Wallace, Alfred Russel (1858). "On the Tendency of Varieties to Depart Indefinitely From the Original Type". Charles Smith (WKU.edu). Retrieved 22 April 2013. ^ "Indonesia quake triggers brief tsunami alert". BBC News Asia. 15 November 2014. ^ "Indonesia Closes Airport after Volcano Erupts". December 5, 2011. ^ a b Lewis, M. Paul (2009). "Ternate - A language of Indonesia (Maluku)". Ethnologue: Languages of the World, Sixteenth edition. SIL International. ^ Litamahuputty, Betty (March 10, 2007). "Description of Ternate Malay". Max Planck Institute for Evolutionary Anthropology, Jakarta station. Archived from the original on 10 June 2007. Retrieved 28 April 2016. Cribb, Robert (2000). Historical atlas of Indonesia. Surrey: Curson. ISBN 0-7007-0985-1. Hanna, Willard Anderson and Des Alwi (1990). Turbulent times past in Ternate and Tidore. Banda Naira: Yayasan Warisan dan Budaya. Wallace, Alfred Russel (1858). "On the Tendency of Varieties to Depart Indefinitely From the Original Type"
The famous naturalist wrote the "Ternate essay", an early discussion of natural selection, while on the island in 1858. Wikimedia Commons has media related to Ternate, Indonesia.